recipient: Concerned human beings, around the world. I have just returned from a trip to Norway, as far north as Kirkenes. 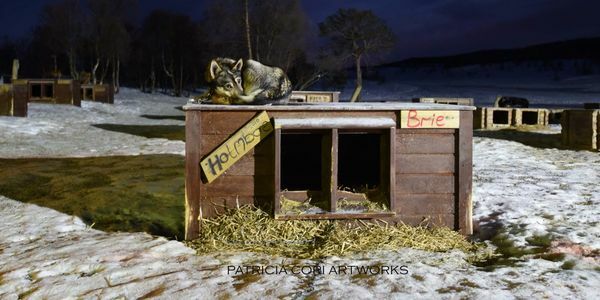 In the location of Tromso, where one of the leading attractions is riding a husky-drawn sled through the snow and icy terrain, I was appalled at how 100 dogs were held in slavery, chained on no more than one meter of chain to their respective wooden huts with nothing but a scattering of filthy hay as their beds. In these subzero conditions (it was almost 20 below when I was there), these dogs remain chained 24/7, except when it is time for them to perform their duty run for tourist, or for some others, to race - again, for the entertainment of humans. The people who run this operation claim the animals are "well cared for," and receive regular treatment from Vets. I do not consider the enslavement of these dogs, who are naturally pack animals, and their chains and miserable freezing cold huts, to be humane in any way, and I protest this behavior and tourist trade to the Norwegian government, you who are considered to be one of the more advanced social environments on planet earth. I realize that this is a highly profitable tourist attraction, and that you will prefer to ignore the outcry of concerned human beings around the globe - and that the business will remain. But surely you can enforce better living conditions for these gentle animals, where they are allowed to run around, to play, to interact, to seek warmth together - to live lives of dignity and some freedom. This petition, once circulated, will be sent to the International Human Society, asking their intervention in overseeing all huskie camps and facilities in Norway, to improve the living conditions of these animals - and doing so, improving our own awareness, and consciousness, as human beings of this planet. We may not be able to change this - but won't you sleep better knowing YOU TRIED???????????????? ?